Davao City Mayor, President-elect Rodrigo Duterte bade farewell to city government workers yesterday (27 June 2016) but not without leaving them with an early Christmas gift. 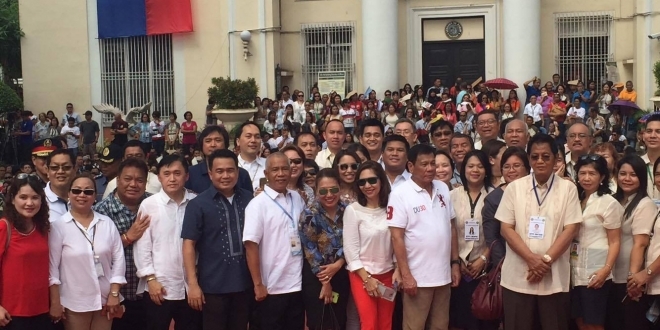 “I’d like to end this by just making you a little bit happy, ” Duterte said as he wrapped up his 50-minute message as the Davao City Mayor during the flag-raising ceremony at Davao City Hall yesterday (27 June 2016). “Plantilla (regular workers) will receive PhP10,000 worth of educational assistance,” he announced. There are a total of 2,487 Plantilla employees in the Davao City government. The PhP10,000 plus job order and other workers, or their part, will receive PhP4,000 each in educational assistance. All in all, the assistance amounts to around PhP65 million. Rodrigo Duterte said members of the DCPO (Davao City Police Office) and Task Force Davao will also receive PhP10,000 cash assistance from the city government. The cash assistance was the last treat Duterte gave to city government workers. He will take his oath as President of the Republic of the Philippines on Thrusday, 30 June 2016. The assistance will come from the salary savings drawn from personnel services. He said the Local Finance Committee issued a memorandum two weeks ago allowing the release of funding for educational assistance for city goverment workers, said Erwin Alparaque, head of the Human Resource and Development Office. Outgoing city administrator Jesus Melchor V. Quitain said the assistance will be released any time now. “We have the money,” he said.